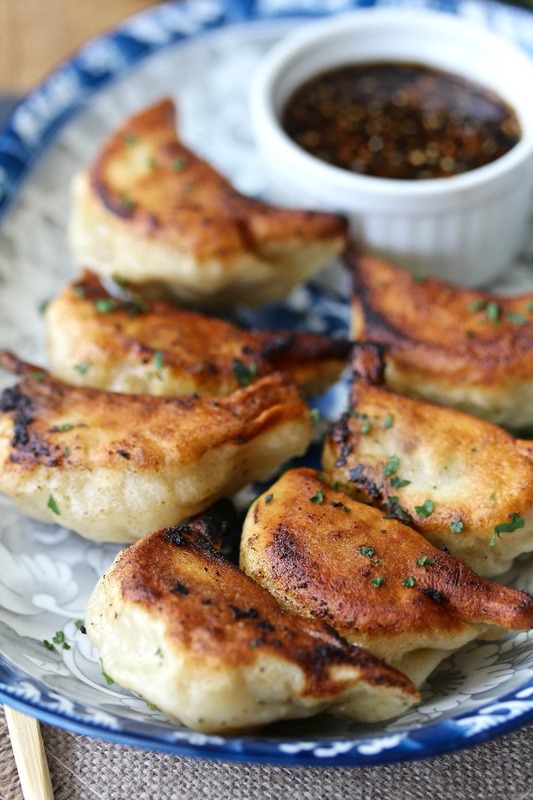 These homemade pork and ginger potstickers are packed with flavor. 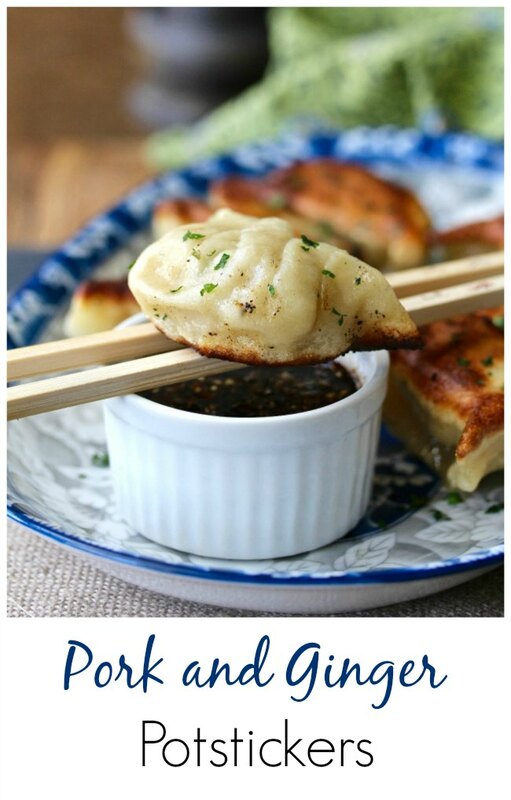 These potstickers are great for parties because you can assemble and freeze them in advance, and then "steam/fry" them straight from the freezer. I made these potstickers with homemade wrappers, but you can skip that step and buy gyoza wrappers in the refrigerator section of the grocery store. The homemade wrappers are a little thicker than store bought. 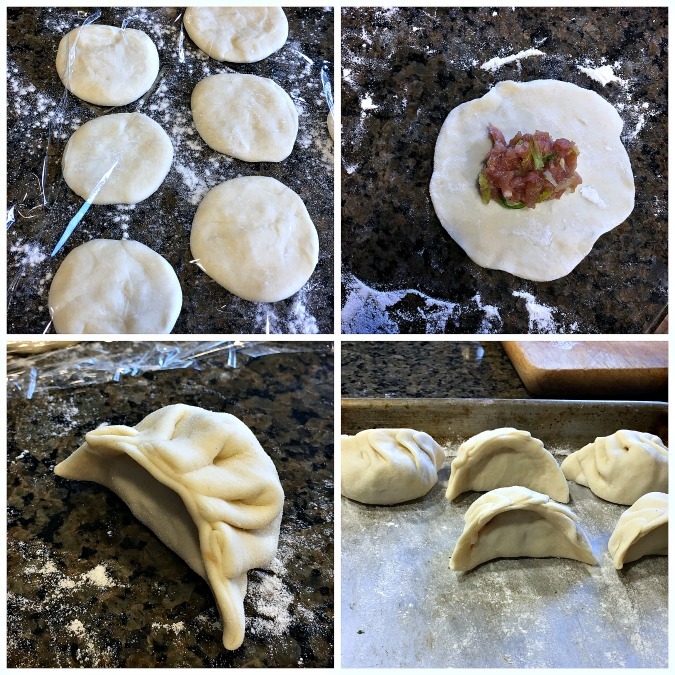 To see the difference, take a look at my pork and shrimp potstickers. First, you make the dough by kneading the flour, salt, and water together and then letting the dough rest. Next, you divide the dough into small pieces and roll them into balls. Next, you flatten the dough balls and let them rest. Next, with a small rolling pin, you roll the dough out into thin rounds. While I didn't do this, if you want to have clean lines and perfect circles, you can cut the dough with a 3 inch round cookie cutter. Place a tablespoon of your filling in the center of the wrapper, and then fold in half and pinch the centers together. Next, begin pleating the dough on one side toward the center, and then on the other side toward the center. You should end up with little "bonnets" as pictured above. Once you've assembled the dumplings, you can steam them, boil, them, use them in soup, or steam/fry them as in this recipe. To freeze them for later, line them up on a baking sheet and place them in the freezer. When they are frozen, place them in a freezer bag for later. You could use a wok, but I recommend using a nonstick skillet with a lid. Just arrange the dumplings in tight concentric circles in the pan that already has 2 tablespoons of oil in it. you will end up with two circles and a few dumplings in the middle. Add 3 tablespoons of water to the pan, cover, and cook over medium heat until the sound in the pan changes from bubbly popping to loud crackling. The water should have evaporated. A glass lid is really helpful here. The whole process should take about seven minutes. Once the dumplings are cooked, shake the pan to loosen the dumplings, and then place a large platter over the pan. Flip the whole contraption over (like a tarte tatin) so that the fried side of the dumplings are on top. You can play around with dipping sauces. For these pork and ginger potstickers, I made a soy dipping sauce with Chinese vinegar, chile oil, garlic, and ginger. Making potstickers may be daunting, but they really are fun. One of the best ways to make them is by having a dumpling party. Pour some wine, assemble your ingredients, and give everyone an assignment. They should be ready in no time! Welcome to Progressive Eats, our virtual version of a Progressive Dinner Party. Each recipe in our menu this month features Tailgate Finger Food, and our host is Coleen who blogs at The Redhead Baker. If you're unfamiliar with the concept, a progressive dinner involves going from house to house, enjoying a different course at each location. With Progressive Eats it’s a virtual party. A theme is chosen each month, members share recipes suitable for a delicious meal or party, and you can hop from blog to blog to check them out. Come along and see all of the delicious tailgate finger food! Mix and knead the dough ingredients together until you have smooth dough. Shape the dough into two 1 inch thick logs, and wrap with plastic wrap, and let rest another 10 minutes. Cut the logs into 30 pieces total (15 pieces each), roll the pieces into balls, and cover with a damp towel or plastic wrap. Press each ball of dough into a disk and cover. Working with one dough piece at a time, roll each out to a thin 3 inch round. Fill each wrapper with a scant tablespoon of filling. Enclose by folding the wrapper in half and pinching together in the middle. Lift left corner and fold toward the center twice and seal. Repeat on the right side. Gently press the dumpling into a crescent shape and transfer to a baking sheet. Repeat with the rest of the wrappers. At this point, you can freeze these dumplings until you are ready to fry them. Toss the cabbage with 1/2 teaspoon of the salt. Let sit for 15 minutes and then drain the excess moisture in a strainer. Rinse with water and drain again. Wrap the cabbage in a kitchen towel and squeeze to remove excess moisture. In a medium bowl, mix the cabbage, ginger, scallions, and pork with your hands. In another bowl, mix the rest of the salt, pepper, chicken stock, soy sauce, rice wine, vegetable oil, and sesame oil. Add the mixture to the pork mixture and mix with your hands to fully incorporate. Cover the mixture and refrigerate for at least an hour and up to a day. Coat the bottom of a 12-inch nonstick skillet with 2 tablespoons of oil. Arrange the dumplings in a circle with an outer ring and an inner ring. Add a few in the middle. Add 3 tablespoons of water to the pan, and set over medium heat. Cover with a glass lid. Let the dumplings cook. You will hear popping while the dumplings are cooking. Once the water has evaporated, after about 7 minutes for fresh dumplings, and 10 minutes for frozen dumplings, the sound will change from popping to steady crackling. Use a thermometer to check the temperature of the contents of the dumplings. They should be about 165 degrees F.
Turn off the stove. Using a fish spatula, loosen the dumplings from the pan. Cover the pan with a large plate and flip the plate and pan over to deposit the dumplings onto the plate. What an incredible bunch of potstickers!! I only wish they were on my table right now. I have to admit that while I know I should only eat a few, my desire is to gobble up the whole plate. 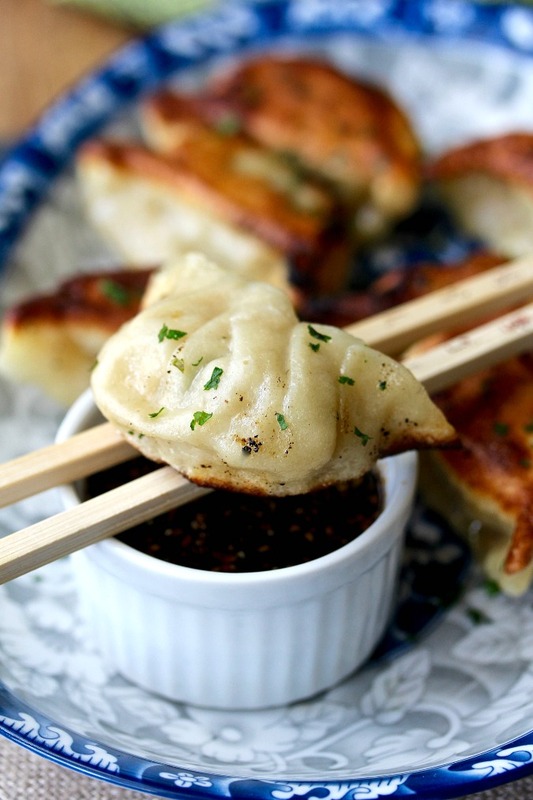 These are picture perfect pot stickers! And the filling sounds terrific!!! Cut the logs into 30 each (60 total) or 30 total? 30 total. I updated the recipe to make it clearer!